We are delighted to work with and be part of the Just A Card campaign, as an advocate of small independent businesses – people who are passionate about their products and who are specialists in their chosen field make the world a much more interesting place! As a small business ourselves we have great empathy with those entrepreneurs who set up their own businesses and we like to support small business in any way we can. Our business mentoring service offering a free consultation to clients is one way in which we try and help. 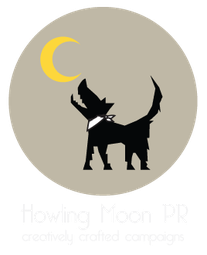 The Howling Moon team consists of Roy Mouncey and Ron Turrell. Together they have extensive experience in public relations and working in business. Roy will handle your PR campaign and is always on hand to discuss and guide you in achieving what you want. Ron deals with the backroom stuff ensuring the information data systems are up to date, that our costs are kept under control and we use modern technology to make this all possible. Ron also works alongside Roy in helping clients resolve business issues through mentoring sessions. Once described by a tutor at college as a "Renaissance man" (being able to turn his hand to most things! ), Roy contributes constructively to each project. As well as PR campaigns he has been creatively involved in helping businesses to develop and grow – even going as far as to design and make tea pot and hotbox covers for one client to supply to a major London hotel. Ron is a businessman with a wide range of experience in assisting businesses, social enterprise and charities. He attended business school at the London Thames Polytechnic, is a qualified personal profile assessor and a BACP accredited counsellor. With over 40 years working as a manager, working director, board director, self-employed business owner and trustee to various charities Ron is experienced in starting up a new business, successfully running and developing an existing business, running and developing a national charity and business mentoring. Ron has extensive knowledge of quality management systems, managing change, personal profiling techniques, self employment, inventing and patenting an idea, personnel problems, implementation of systems, payroll and accounting, social enterprise, developing small charities.